We at hog roast Gatwick always count our blessings, as we are based in such a lovely part of the country. The guest of honour was a keen walker himself, as were a lot of his mates, and that’s how they celebrated John’s ‘Big Day’ – by going for an invigorating walk, followed by a slap-up buffet. That’s why we enjoy our work so much, no two events are ever the same and you get to find out about people’s hobbies and interests. The hog roast Gatwick party was held at John’s parents’ house as they have a huge garden. When we went around to the house to set up our catering equipment, most of the guests were out on their trip and, as we always do, we got started preparing the roast lamb and all the side dishes from scratch. As time went on, the walkers arrived home and it really made us feel proud to hear the reaction as they walked in to the tantalising aroma of juicy lamb, slowly roasting on the spit. They all got changed from their walking boots and waterproof jackets to some very smart attire for the evening do and then it was time for our chef to carve the slices of tender meat on to the waiting plates. The guests helped themselves to sweet mint sauce, potato salad and coleslaw to accompany the roast lamb. John had 15 guests plus three dogs at the party, so there was plenty to go round. We had also prepared a fresh fruit salad for dessert which was followed by birthday cake. The evening raced by and soon it was time for the hog roast Gatwick team to clear away our disposable plates and napkins, and pack up our equipment. In the background, all I could hear was a room filled with happy people, chattering away after enjoying a yummy buffet. It’s one of my two favourite sounds – the other is the sound of our roasts sizzling on the spit! The beauty of a slow cooked hog roast is that minimum effort is required on your behalf. This leaves you free to enjoy your event with your guests and take all the credit for minimum fuss! At the end of your event, Hog Roast Gatwick will be on hand to carve any remaining pork for you to keep before cleaning down and clearing away all equipment and rubbish from the venue. 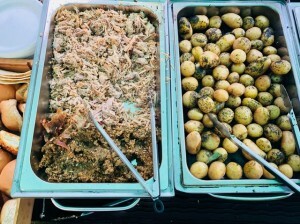 Hog roast Gatwick is the simple, tasty and cost effective way to feed a crowd and wow them at the same time. We also support the local farming community by always choosing local meats. Hog roast Gatwick operate strict standards with all their suppliers to ensure that the pork is of the highest quality and ethically sourced. All meats are hung for maximum flavour and delivered fresh to your venue on the day to be cooked from scratch. Bread is sourced from local bakeries and sauces are homemade from local produce. If you are holding a large celebration or wedding then it might be worth considering the very popular Buffet Menus. It really is your event and you can be a hog roast chef yourself and simply hire the machine and equipment needed or you can choose to let hog roast hire Gatwick supply everything from full sized marquees, cutlery and crockery to a fully catered event with chefs, catering staff and waitresses to really make a statement. 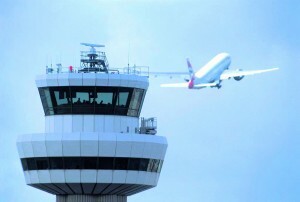 Now, you’d be forgiven for thinking ‘Gatwick’ was simply an airport near London, and a major one at that but far from it! In fact, Gatwick is a little hamlet in Surrey, located just a stone’s throw from the A31, more appropriately called Hog’s Back! It stands to reason with a name like that, hog roast Gatwick should be uppermost in the mind. 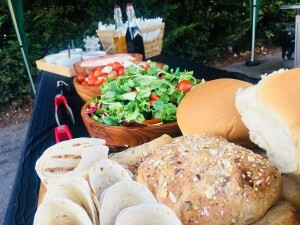 Needless to say, we enjoy hog roast Gatwick catering for a range of parties and events in and around the Gatwick area. We’re lucky to have numerous golf clubs in the vicinity plus some fantastic walking routes, for people, often accompanied by their dogs, to take in the beauty of the Surrey countryside. 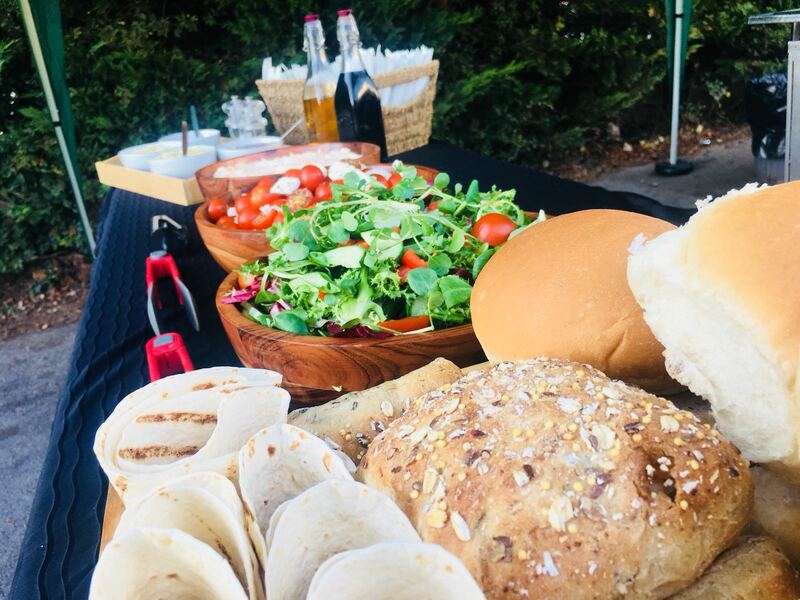 The thing I love best about walking is that it builds up a hearty appetite – just the job for an event where we at hog roast Gatwick are providing the delicious food! One of our recent bookings in the area was a 40th birthday party.